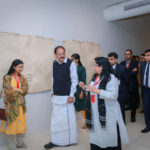 Vice President of India Mr Venkaiah Naidu visited Kiran Nadar Museum of Art (KNMA) last evening, 14th February 2018, to support the landmark exhibition ‘Vivan Sundaram: Step inside and you are no longer a stranger’, A Retrospective: Fifty Years, which opened on 8th February 2018. 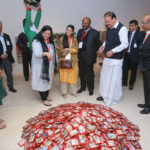 Ms Roshini Nadar, Executive Director and the CEO of HCL, Mr Shiv Nadar, Founder and Chairman of HCL, and Shiv Nadar foundation leadership, were accompanied by the students of the Shiv Nadar Foundation institutions to warmly welcome the honorable Mr Naidu to the museum. 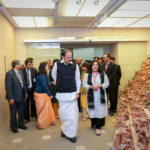 Speaking about the importance of Indian arts heritage and the evolution of contemporary art across the country, Mr Naidu congratulated the museum’s founders for their innovative public programmes and exhibitions, which he said have made “significant contributions to arts and culture across the country and internationally, that support nation-building”. 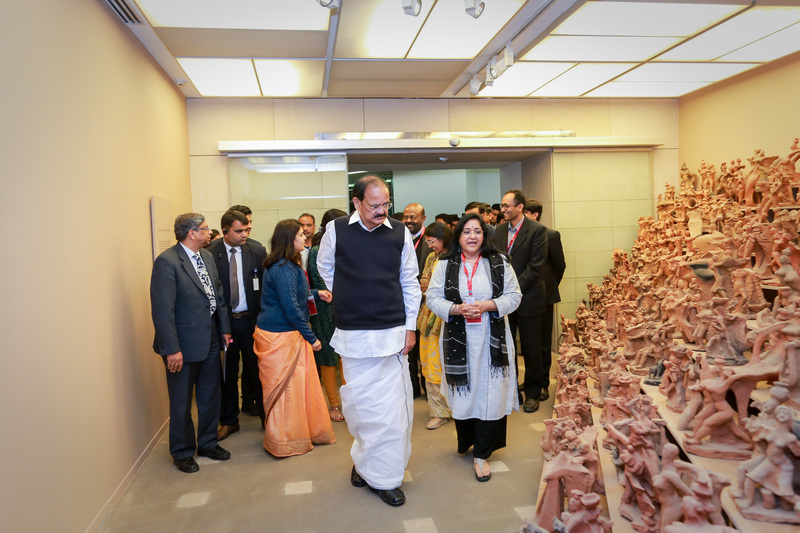 He also said that the museum’s founder Kiran Nadar was a “key individual in the activation of South Asian arts”. Ms Roshni Nadar speaking on behalf of the museum and the Shiv Nadar Foundation, talked about KNMA’s history and development over the last eight years, instigated by Mrs Nadar who opened the space in 2010, to share her art collection with the public, “I was also acutely aware of the existing dearth of institutional spaces for the public, and wanted to bring visibility to modern and contemporary art from India and the subcontinent, and share the incredibly diverse talent of our artists”, says Mrs Kiran Nadar about the museum. KNMA works on bringing art into the public sphere by activating art appreciation and nurturing a museum-going culture in the capital. KNMA aspires to become a place for confluence, through its curatorial initiative and exhibitions, school and college workshops, art appreciation discourses, symposiums and public programs. It is focused on bridging the gap between art and the public. 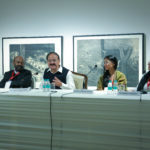 Mr Naidu, acknowledged KNMA’s vision of bringing important Indian artists to the public via innovative exhibitions, publications, educational, and public programmes, and described his great pleasure in experiencing the rare and extraordinary works of one of India’s highly celebrated and influential artists, Vivan Sundaram, whose 50 year retrospective, Vivan Sundaram— Step inside and you are no longer a stranger, will be on display at the museum until June 30 2018.